Nobody ever told you as a kid that making friends as an adult can be difficult. I was fortunate as a child to grow up in a neighbourhood full of kids to play with and was always enrolled in 4985 activities where I easily made friends. I had my #girlsquad in college from my dance team, but since then, it’s been trickier. It’s not because I can’t find like-minded individuals or anything like that, but I think I might be some-what of an introvert and well, people are busy… Moving to a brand-new city didn’t make things easier, but one thing is certain – in order to make friends, you have to be a good friend yourself. For as comfortable as I am at putting myself out there on the Internet or over social media with my “brand,” I can be just the opposite in real life. Since I work from home, I don’t have any co-workers to befriend. And while I have some amazing mommy friends with kids Everett’s age, most of them are back at work themselves. Thankfully, the very few friends I have made over the past three and half years that we’ve lived in Vancouver are great ones. Like in a “I can’t believe I am this lucky to have found you in a sea of people” kind of way. But like I said, people are busy and have their own lives, myself included, so it can be tricky to get together and really nurture those relationships. Truth is, I am perfectly happy hanging out at home with my tiny family most of the time. But then I get homesick when I see my old friends in Cali get together, get struck by loneliness when I catch a group of mommies and their kids together while Ev and I are playing by ourselves, or when it’s Friday afternoon and I am counting the minutes until Brett is home so that I have another adult to talk to. So after Amy and I chatted for months about a baking date and then I almost chickened out at the last minute, I had to remind myself that “Tessa, you have to be a friend to make one,” or rather Brett had to remind me. And I am so glad he did! I admired Amy’s gorgeous cakes and perfectly curated Instagram for months before officially meeting. Meeting bloggers in real life is almost like going on a blind date. You hope that they aren’t too strange or annoying in fear that their online presence will be forever ruined. LOL. Fortunately, Vancouver just happens to have some of the coolest bakers and bloggers around. I like to think of Amy as my young, hip friend. Straight from grad school to working a food media gig downtown and being only 25, I honestly don’t even know why she would want to hang out with an old mom like me? So after months of talking about a collaboration, I was surprised when she agreed to spend her Saturday baking with me and my wild child and crazy dog. I’ll admit that I have never been very good working in groups. I am totally comfortable taking charge or just taking direction and doing what I am told, but I am not very good in the in between. Now I already knew I liked hanging out with Amy, but working together with someone always brings up a bit of anxiety for me. What if we disagreed and our new friendship gets ruined? What if she spends the day with me in my crazy house and runs for the hills? Thankfully, this wasn’t the case (or at least I don’t think it was – Amy?). All fears were quickly set aside when she came over and quickly made herself at home. She browsed my over-flowing cookbook shelves, started opening cabinets in my kitchen (we were baking together, after all), and even included Brett in her Snapchats, lol. Collaborating with another blogger was definitely new to me and I loved it. I spend most of my time working all by myself with sometimes only a toddler to bounce ideas off of. Amy has incredible food styling skills, so I had a lot of fun just photographing as she worked her magic. While I was worried at first that we would run out of things to talk about as our pie baked and cooled, instead we let it bake a bit too long (apologies for the burnt sugar!) because we were chatting too much. Remy quickly warmed up to our guest and even Everett was showing off a bit. And after she left, I told Brett how much she reminded me of my cousin, Daina. They are the same age, have a similar sense of humor, and both hard-working without taking things too seriously. I’ve always said my cousin was like the little, annoying sister I never had, so for anyone that hasn’t had a chance to meet either of these amazing young women, this is actually a pretty big compliment, hehe. 2. Cut in the cold butter with a pastry cutter or by hand, rubbing the pieces of butter between your thumb, index, and middle fingers. Once the pieces are no longer lager than about a pecan, begin to flatten the pieces of butter in sheets between your palms. Be careful not to over-work the butter or let it get too warm. 3. Working with only a couple tablespoons at a time, add in about 4 to 6 tablespoons of the water along with the vinegar. Stir together using a wooden spoon or even just a clean hand in the bowl. The dough should appear fairly shaggy and not sticky. Dump the contents onto a clean work surface and use a bench scraper to gently fold the the dough until it begins to hold shape and stick together. Do not over-mix. 7. For the braid/lattice top, repeat step 5. Using a ruler and a paring knife, cut about 5 X 1 1/2-inches wide strips as well as 15 X 1/2 inch strips. Braid the thinner strips together in groups of three. Place on a baking sheet or cutter board and place in the refrigerator. 9. Fill the chilled pie crust with the filling. 10. Remove the cut strips from the refrigerator and begin creating a the lattice pattern, carefully weaving over and under each strip of the opposite direction – wide strips going one way and the braids going the other. Allow for some excess dough on the end of each strip, then trim. 11. Fold up the edges of the bottom crust up and over the top. Pinch to seal then crimp with using your thumb of one hand and the thumb/forefinger of the other. 12. Return the pie back to refrigerator for at least 15 minutes. Meanwhile, pre-heat oven to 425 degrees. 14. Place pie on a baking sheet and bake for about 20 to 30 minutes. Turn the temperature down to 375 and bake for an additional 20 to 30 minutes or until golden brown. If the top begins to brown too quickly, cover with foil. Head over to Amy’s blog, Constellation Inspiration, for more pics and the Plum Fig Thyme Filling recipe! – When in doubt, keep that butter COLD!! Be sure to refrigerate the pie dough between each step. Keep the butter cold will help prevent the baked crust from shrinking. – Do not over-mix the dough. Keeping pieces of cold butter from completely integrating with the flour will make for a flakier crust. When the cold butter hits the hot oven, it begins to melt. The heat causes the butter to steam/evaporate and makes flakey layers in the baked crust. – Keep the water added to the dough at minimum. Only mix in a tablespoon or two at a time. – Gently work the dough with your hands and a bench scraper. Once the dough comes together in the bowl, dump it onto a clean work surface. Use the bench scraper to scrape under the dough and fold over itself instead of kneading like a bread dough. – Don’t be too intimidated by the braids! If you keep the dough cold and have a little patience, it is not too difficult – just slightly time consuming. Vancouver is one of the best cities I have ever visited, and I am so thankful that I get to live here. What I love about this city is that it seamlessly incorporates a metropolitan, International city with beautiful urban parks, a glistening coastline, and majestic mountains - just 15 minutes away. We live in a quieter, more quant neighbourhood that I adore and somehow I still get a sense of home-iness amongst the high-rises and tourists. And while real estate is steep and we may never have a yard (at least not while living in the city), this city offers so much just outside of my doorstep that I don't know if I will ever give it up. The second thing that I was most excited about was that the opening of the market was also the start of berry season. Hallelujah!! It is finally here!!! Until this time of year, I scope out the weekly berries at the grocery store, usually either too stingy to pay their hefty price tag or less than enthused about their quality. But not these summer months! I spotted basket after basket of perfect strawberries. You know, the cute little ones - still with their stems and in funky different shapes. Like juicy rubies - just awaiting their fate. I definitely see many strawberry tarts and treats in my near future. 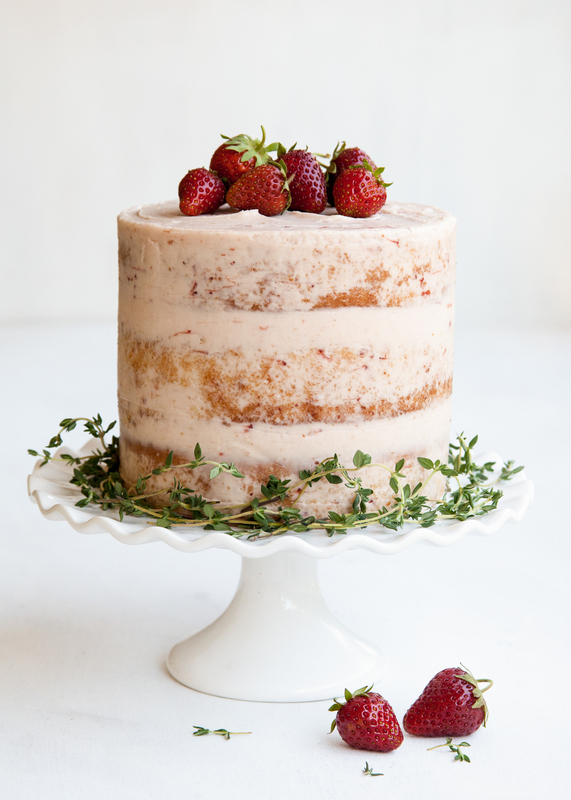 The frist thing I made with my first flat of strawberries of the season (yes, I went for the big basket) was this Strawberry Thyme Cake. This cake boasts fresh, lively flavors and completely embodies the ease of summer. wanted to create a cake that could equally be shared at a casual picnic in the late-afternoon shade as well as something stunning enough and unexpected to bring to a summer dinner party under the stars, and this beauty certainly delivers. With its unfrosted, “naked” sides and a wreath of fresh thyme, it is simple yet dramatic. The addition of fresh herbs adds a bit of interest and a welcoming twist to otherwise basic flavors. Be sure to head on over to The Cake Blog for the recipe!